It's no surprise that wireless media streaming is attracting a lot of attention, given the number of companies targeting this area. This is a market that's set for much growth during the remainder of 2005. Buffalo isn't the first networking firm to try its hand at wireless streaming devices, either. Netgear and Linksys have previously dabbled in the market, while Philips has its Streamium range of top-end AV kit, all of which is Wi-Fi compatible. 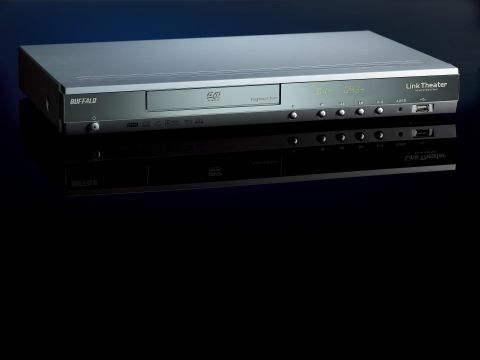 Yet the only real product comparable to Buffalo's new LinkTheater is the D-Link MediaLounge DSM-320, which costs about £30 less and lacks a DVD player. The progressive scan DVD player supports SVCD and PC data formats as well as DVD. It's not the best player we've ever seen, but it's another string to the LinkTheater's bow. After all, wireless streaming still isn't the most mainstream of activities. You can connect the player to your TV using the supplied composite lead or via S-video. There's no Scart socket, although there's an optical audio output. When it comes to streaming, we're impressed with the breath of formats. As well as VMV and VMV high-definition playback, the player can also stream the standard and high-definition versions of DivX. DivX compatibility is always good to see. The other key formats are audio-based. MP3 and WMA feature, but that's by no means an exhaustive list. The set-up process is often patchy with these types of devices, and so we were pleased that the LinkTheater easily paired up with our PC. The supplied remote guides you around the LinkTheater's interface. It's nothing special, but then it doesn't need to be. Another nice touch is that the LinkTheater features a USB 2 port on the front so you can play content directly from a removable hard drive. Of course, it's up to you whether you want to use the integral 802.11g wireless, or whether you wire the LinkTheater up via Ethernet. The deciding factor will be the location of your kit within your home.